Q: Who are you? How would you describe yourself to your readers? 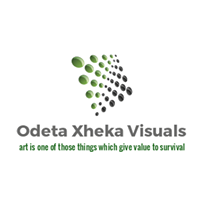 My name is Odeta Xheka. I am an artist, author and fun mom boss in a quest to implement art in people's lives. Currently expanding picture book norms to create an interactive space where children can write, draw, and color ON the page in order to establish a sense of agency by adding to the story. Q: Why did you decide to write it? Q: What is special about your book? The book has a very clear message, that of open mindness in front of the unknown- a most timely message. At a time when old and young alike are continuously asked to think of the immigrant, the gender fluid, the poor, “the other” in terms that instill fear and confusion, Here Comes Ingo is the type of book that allocates agency to its young readers. The message is clear albeit a bit more direct and maybe a little less preachy than most books for young children. Let’s just say that as a longtime fan of Maurice Sendak and mother to a very inquisitive 8 y.o. boy and 6 y.o. girl I don’t believe in sugar coating reality. To me, this is another way of approaching children with truth, honesty and authenticity. Real life is not just colorful and happy; life also has darkness. I don’t believe we should coddle children and shelter them from life. With this book, I intend to make it safe for children to face things with their eyes open and to accept that things can be confusing and that not “getting” something at first glance is totally acceptable. They are invited to look harder, probe deeper and make sense of what is in front of them. Q: What type of readers will be interested in your book?